As a collegiate athlete I have experienced many injuries from sports, yet it was somewhat alarming when I developed chronic hip pain. Being 20 years old and not being capable of bending over to tie my shoes is not something with which a lot of young adults have to deal. Surprisingly, this is more common in athletes between the ages of 20 and 40 than you may think. In just one year, three young women on my college lacrosse team and several of my classmates who played sports all suffered from the same type of pain. The diagnosis? A torn labrum. Arthritis isn’t a word that college athletes hear very often, but after tearing my labrum it was something that I had to discuss with my doctor. I received a cortisone shot to temporarily relieve the pain and allow me to play for several months of my lacrosse season, but when it wore off I was warned not to get too many because they can cause arthritis in the joint. I had to discuss the long term effects that this injury can have on my body and learn about labral tears leading to arthritis. When you are only 20 you think that arthritis is something you won’t have to worry about for 40 or even 60 years yet I had to worry about developing it in my early 20s. When I tore my labrum, I thought I had just pulled my groin or strained a muscle. I didn’t even know what a labrum was. I learned that the hip is a ball-and-socket joint made up of the femur, the femoral head, which attaches to the pelvis, the acetabulum, and the labrum lies between the two. The labrum, along with some cartilage, protects the joint and gives stability to the hip by deepening the socket and providing a seal of the hip joint. 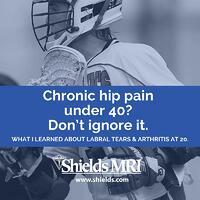 Labral tears are common in active adults between the ages of 20 and 40 due to either repetitive trauma or overuse. They are commonly a result of trauma while running, twisting, or falling, and can often be felt immediately afterward. I was cutting when I felt a sharp pull, but others start to feel pain over time, with chronic pain in their hip that is not healing or potentially worsening. I soon learned that labral tears most often occur due to other issues within the hip, such as femoroacetabular impingement, more commonly known as hip impingement. This impingement in the hip is an abnormal bump on the femur that causes unwanted contact between the femur and the pelvis. X-rays showed that I was born with hip impingement and this contact caused friction of the joint that tore the labrum over time. If you are experiencing chronic pain in your hip, seek medical attention sooner rather than later. I tried to continue exercise and lacrosse after I had torn my labrum because I thought the pain would soon go away but it only got worse. Doctors will often recommend an X-ray to see whether there is any damage to the femur or pelvis. Following an X-ray, an MRI may be done to better see the labrum and other soft tissue of the hip. When looking for a labral tear, doctors often use an MRI arthrogram to get a clear picture of the soft tissue and locate the tear. The MRI arthrogram clearly depicted a tear in my labrum and allowed my doctor and me to decide what to do next. When I was told by my doctor that I was going to need an MRI arthrogram, I had no idea what that was. When I arrived at Shields they walked me through the entire process and told me everything that I wanted and needed to know. An MRI arthrogram is a two-step process involving both an X-ray and an MRI. To better see the tissue in the joint, a contrast will be injected in between the femur and the pelvis to enlarge the joint and allow for a better picture. A radiologist will inject the contrast into the joint using fluoroscopy, which is a type of X-ray, or ultrasound to help guide the needle into the correct place. Contrast is often used in joints to allow the doctor to see more in the imaging. The doctor will then assess the tear and determine what the next step may be. 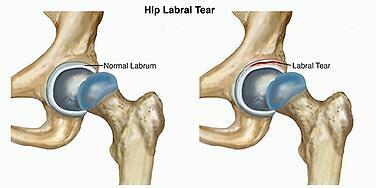 What is the next step if a labral tear is found? After finding a labral tear, there are a few options to deal with the injury. Nonsteroidal anti-inflammatory drugs (NSAIDs): Recommended for use to relieve pain and reduce inflammation. Intra-articular injection: Also known as a cortisone injection may be done to lessen the pain temporarily. Injections could relieve pain for as long as six months or as short as a few days. This is not a permanent solution to a labral tear, so further measures may be taken if pain continues. Physical therapy: often recommended to strengthen the muscles surrounding the labrum and to improve hip stability. Arthroscopic surgery: often recommended if non-surgical options listed above do not alleviate the pain. Most surgery options for labral tears are minimally invasive and can be done in an outpatient surgical setting. After tearing my labrum I decided to begin physical therapy right away. Physical therapy has helped strengthen my muscles, but I have decided to go forward with arthroscopic surgery so that I can return to athletics after recovery. The recovery period is about 4 to 6 months with physical therapy following surgery so I hope to regain strength in my hip and then return to collegiate lacrosse next season. If you are experiencing chronic pain in the hip, call your doctor today and make sure to ask for Shields MRI when scheduling your imaging. We will do everything we can to make you more comfortable and get you on the road to recovery. Shields offers MR arthrograms at 20 locations throughout Massachusetts, New Hampshire & Maine.